Steelcraft Elevation Series Bumpers provide exceptional protection for your vehicles and most importantly, for your family and friends. Steelcraft heavy duty front end replacements are manufactured with the highest quality materials and workmanship. All Steelcraft's heavy duty products come with a 2 year limited warranty and are manufactured with high quality punched plate instead of expanded metal as most others. Also allow customers to retain their factory fog lights and tow hooks. Does Steelcraft 60-12260 fit your vehicle? 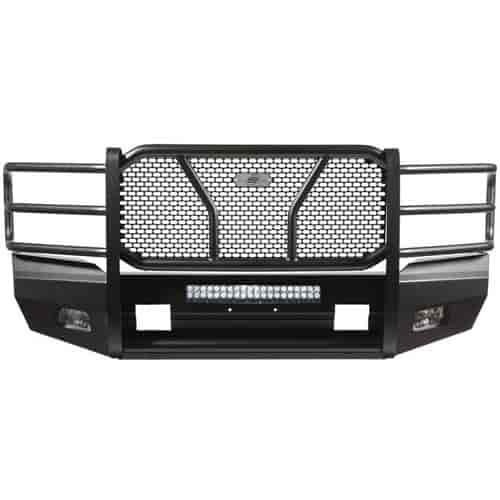 60-12260 - Steelcraft Elevation Series Bumpers with Grille Guard is rated 5.0 out of 5 by 1. Rated 5 out of 5 by Steve D 123 from Looks great! After fighting to remove dented factory bumper the steelcraft went on smooth and easy. Fits great, great quality, looks great! Fog lights could mount shallower I think. Plenty of ways to run wire across from sensor to sensor and fog lights. Bumper lines and truck lines flow nice together. Also did flat black wire mesh grill. Is this bumper available for a new 2019 Ford F-250? Steelcraft has not released the 2019 application information yet.